I really enjoy fresh asparagus. Asparagus grew wild in the concord grape vineyard behind our house when I was a kid, and we could just walk out there and get it in the spring. I enjoy eating asparagus cooked until it is bright green and the tops are still crisp-tender. I like it with a little butter on it, or with hollandaise sauce on it. 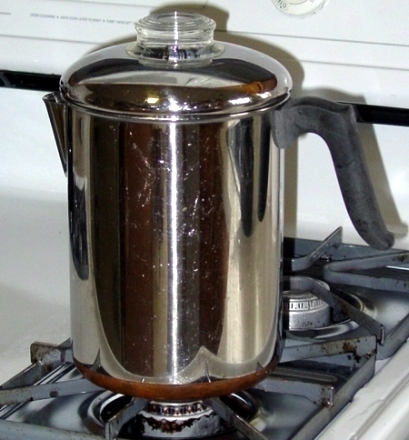 I use an old stainless steel coffee pot, but any pot, that has a cover, in which you can stand the asparagus will work. If you can't find a pot with this shape, then use cooking string or rubber-bands to hold the asparagus together, and use a pan in which they will fit laying down. If your asparagus spears are thick, then you may want to peel them, as the outer skin is fibrous. Peel them from the bottom of the stem to just under the bud at the top using a vegetable peeler. 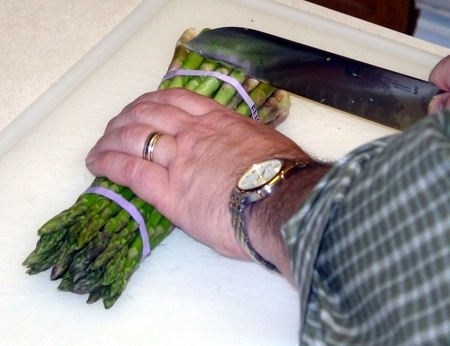 Trim the woody part from the bottom of the asparagus spears. Break or trim the bottoms off the asparagus spears. If you break them, they will naturally snap in about the right place so you just have the tender upper portion of the asparagus spear, and the tough woody part can be discarded. I usually just trim off the woody part with a knife as shown in the picture. Put enough water to just cover the bottom inch or so of the asparagus in your pot or pan. Stand your asparagus up in your pot or pan. Bring the water to a boil with the pot or pan uncovered. 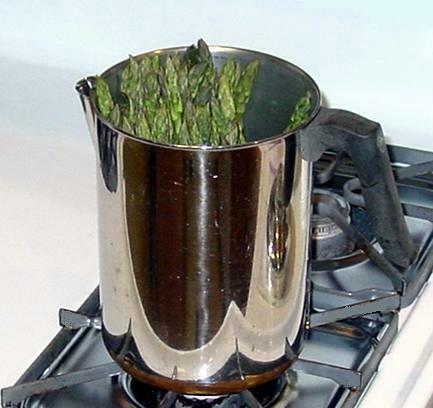 If using a tall pot, cover it and allow it to boil and steam the tops of the asparagus for five minutes. At this point remove one of the spears and eat it to see if it is done enough for your taste. 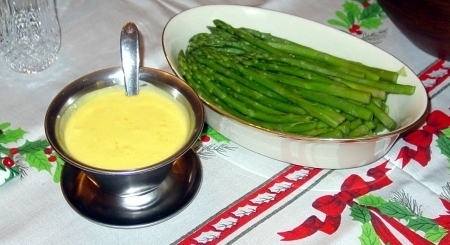 The asparagus should be bright green and crisp but tender. It will take longer to cook spears that are thicker. If it isn't done enough, then continue to cook it for two more minutes then test again. If using a pan, simmer them standing up for a minute, then use kitchen scissors to carefully trim the string or rubber bands allowing the asparagus to lay down in the pan. Simmer for five minutes uncovered then test for doneness. Drain your asparagus, and put them on a serving plate. Add any butter or sauce you plan to use, and salt to taste.